Police-involved deaths have attracted considerable media and public scrutiny in recent years. As a society, we value life, liberty and security of the person as core values worthy of constitutional protection. When government officials interfere with these core values, the call to publically account for that interference is understandably very significant. In recent years, deaths in police custody have attracted considerable public scrutiny. The death of individuals in police custody is a cause of public concern for a number of reasons. The loss of human life in such circumstances can have an adverse effect on police-community relations, and raises concerns about accountability and public trust in regard to police actions which are largely invisible, particularly when they occur inside a police station. Police need to be held accountable for deaths arising among individuals under their charge. Analyzing these events helps to develop a better understanding of the death in custody phenomenon, thereby promoting trust between the police and the public. 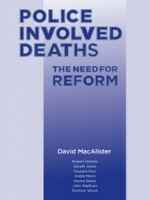 This research seeks to develop the literature in this area by canvassing the nature of the circumstances which typically give rise to the death of an individual who has been brought into police custody.